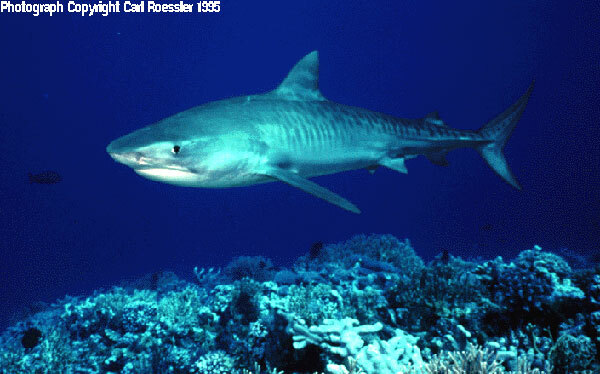 Image of this 12 foot Tiger Shark courtesy of Mr. Carl Roessler. “Their village was on the north coast of Puerto Rico near the modern town of Vega Baja. The two fishermen left the village as the sun was rising in the east. They pushed their small dugout canoe into the gentle surf and began paddling toward the azure reef line about 500 meters from shore. Small whitecaps broke on the reef marking their destination. They were probably using hook and line, spears, or a net; or possibly all three depending on the conditions that day and the fish they were encountering. Their prey was the groupers, snappers, parrotfishes, and grunts that live in close association with the reef. Then suddenly, their world was turned upside down. “There was no soundtrack music to raise the alarm, just the gentle lapping of waves on the side of the canoe as it bobbed gently in the light chop generated by the shallow reef. It was likely a beautiful morning. High cumulous clouds in a robin’s egg blue sky with golden rays of sunlight projected by the dawn. Peace and beauty, and perhaps a bountiful catch. “They had hooked and likely speared several fish, which they discussed in animated voices. The thrill of the hunt, and the joy of success. There were sharp pulls on the cotton handline. The fisherman reached with his right arm over the side of the dugout. But before he could free his catch, a monster rose out of the depths. The tiger shark, attracted by blood from the bleeding fish, bit sharply into the fisherman’s upper arm and began its death roll. Failing to sever the upper arm at mid shaft, it tore the flesh from his arm as its razor sharp teeth descended toward the elbow. At the elbow the strength of its bite and the violent twisting of its body ripped the lower arm cleanly away. Blood gushed from the amputated extremity. Although this recreation of an event that took place more than 1,000 years ago is somewhat fanciful and perhaps even melodramatic, it fits what we know of life in pre-Columbian Puerto Rico. In the late 1980s, Dr. Peter E. Siegel, with support from the Centro de Investigaciones Indigenas de Puerto Rico, directed archaeological excavations at the pre-Columbian site known as Maisabel on the north coast of Puerto Rico near the modern town of Vega Baja. The research was the basis for his Ph.D. dissertation, Ideology, Power, and Social Complexity in Prehistoric Puerto Rico. Dr. Siegel found that the site had been occupied from around 120 B.C. until A.D. 1000, making it one of the earliest and longest-lived villages in the West Indies. The site is composed of 6 middens, deposits of pottery, food remains, and other artifacts, arranged in a roughly circular shape. The middens surround a plaza in which very few artifacts were found. However, during the excavations Siegel discovered that the plaza was a large cemetery. In his words, Dr. Siegel describes this as the axis mundi, the central axis of the world in the eyes of the people who created it. The axis mundi served to connect the various layers of the cosmos. The cemetery held the bones of the ancestors, who were venerated by their living descendants. Burial number 17, a 29 year old male who was fatally attacked by a tiger shark more than 1,000 years ago. Dr. Siegel enlisted the assistance of Linda Budinoff, a graduate student studying human remains, for the analysis of the skeletons that he excavated. Her conclusions were presented at the 12th International Congress of the International Association for Caribbean Archaeology in Cayenne, French Guiana, and were published in the Proceedings of the Congress. Burial number 17 turned out to be of special interest. 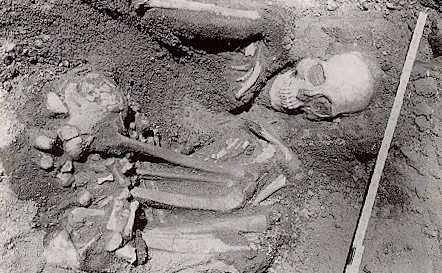 According to her analysis, burial 17 was a 29 year old male. He was buried in a flexed (fetal) position, with prehistoric pottery, chert flakes, unmodified raw local stone, shell, chert hammerstone, calcite, ochre, and a coral abrader. The skeleton is complete with the exception of the lower right arm and hand. There are a series of cut marks on the upper right arm (humerus), which Budinoff says could indicate he “may have been tortured and executed” (p. 118). One radiocarbon date places the time of death sometime between cal AD 789 and 1033. This skeleton, along with another that had a stingray spine lodged between its ribs, were used as evidence for armed conflict at the time. The characteristics of the multiple cut marks led me to question whether they were actually caused by a weapon. For instance, the marks occur on opposite sides of the bone with all of the cuts in a downward (distal) direction. One can easily envision someone being struck in such a way on the outer part of their arm, but it is difficult to imagine how similar cuts were made on the inner arm near the body. If the arm was raised when the blows were struck, then the cuts would occur in an upward direction toward the proximal end of the humerus. In other words, the cuts on the inside and outside of the arm would occur in opposite directions. Since burial 17 had multiple cuts on the inside and outside of the humerus in the same direction, I sought expert counsel. Budinoff provided several excellent photographs of the injury (reproduced here courtesy of Dr. Peter Siegel and the Centro de Investigaciones Indigenas de Puerto Rico). These photos were examined by the late UF forensic anthropologist Dr. William Maples, author of Dead Men Do Tell Tales (co-author Michael Browning, Doubleday, 1994). Maples was not told where the bone came from, nor any other information about its context (though he knew that I worked in the West Indies). His first suggestion was that a machete caused the cuts. I explained that there were no metal tools available at the time the wound was made. Next he suggested obsidian, but again there are no obsidian tools from this area. He stated that a chert (flint) tool might be possible, but that it was difficult to sharpen stone tools to the point at which they could produce such sharp cuts. Moreover, he noted that there were multiple cuts in close proximity that were all in the same direction. These were not the wounds a living individual would get, for example, in an axe or machete fight. If this individual was fending off attack then the multiple cuts would have been widely spaced on the humerus and lower arm. Moreover, defensive wounds are far more common on the forearm (we naturally raise our arm in front of us to fend off attack) then on the upper arm. If the cut marks were caused by human agency, they would have had to occur after the individual was incapacitated. The key, however, was the tiny striations associated with the cuts. These are not typical of human tools. When asked whether a shark could have produced such cut marks he exclaimed “absolutely.” He directed me to George Burgess, keeper of the International Shark Attack File, which he maintains in conjunction with the American Elasmobranch Society. As Keeper of the shark attack file Burgess has reviewed more than 3,000 cases. After examining the photographs he concluded that the markings were typical of bone damage inflicted by a shark. Moreover, he felt that the striations associated with the cuts made it likely that the culprit was a tiger shark (Galeocerdo cuvier). He reported that the tiger shark will bite its victim and if it is not able to sever the appendage on its first bite it will tear the flesh and bite again all the while twisting its body to use its weight and strength as leverage. Often what will happen is that the appendage will be severed at a joint. This is exactly what we see with burial 17. Apparently the shark was not able to bite through the humerus on its first try. It must have released its bite, bit again, and tore the arm off at the elbow. For us, life is composed of a series of individual events, yet the most an archaeologist usually can hope to achieve is generalizations about what happened in the past. In certain rare instances, such as this man from Maisabel, we see life and death frozen in an instant. Just when you thought it was safe to go back into the water. Special thanks to Dr. Peter Siegel for allowing me to use the material from his excavations at Maisabel. The above interpretations are my own and not those of Dr. Siegel. The photographs of the bones were taken by Linda Budinoff. Her excellent analysis of the skeletal remains is much appreciated. The radiocarbon date was obtained by Dr. Anne V. Stokes in the course of her Ph.D. research into prehistoric diet in the West Indies. Budinoff, Linda C. (1991). An Osteological Analysis of the Human Burials Recovered from Maisabel: An Early Ceramic Site on the North Coast of Puerto Rico. In Proceedings of the 12th Congress of the International Association for Caribbean Archaeology, L. S. Robinson (ed. ), A.I.A.C., Martinique, pp. 117-134. Siegel, Peter E. (1992). Ideology, Power, and Social Complexity in Prehistoric Puerto Rico. Doctoral dissertation, State University of New York, Binghamton. Stokes, Anne V. (1998). A Biogeographic Survey of Prehistoric Human Diet in the West Indies Using Stable Isotope Analysis. Doctoral dissertation, University of Florida, Gainesville.